Home > Blog > Indonesia Charts a New, Low Carbon Development Path. Will Other Countries Follow Suit? Farmers in Yogyakarta. Indonesia’s government is charting a new, low carbon path to development. Photo by the International Rice Research Institute. 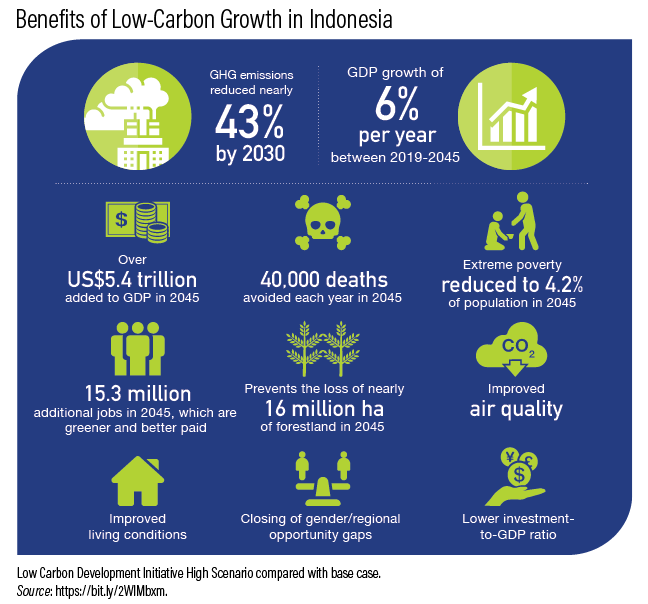 A new report from the Indonesian government’s Low Carbon Development Initiative found that less carbon-intensive, more efficient energy systems can deliver an average of 6 percent GDP growth per year until 2045—even more economic growth than the business-as-usual path, with continued gains in employment generation, increased incomes and poverty reduction. This strategy would cut the country’s greenhouse gas emissions nearly 43 percent by 2030, exceeding Indonesia’s international climate target. The government is now feeding findings from this new report directly into its next five-year development plan, which will cover 2020-2024. By doing so, Indonesia can upend the false choice between economic growth and sustainability, and show countries around the world that it is now entirely possible and profitable to tackle climate change economy-wide. 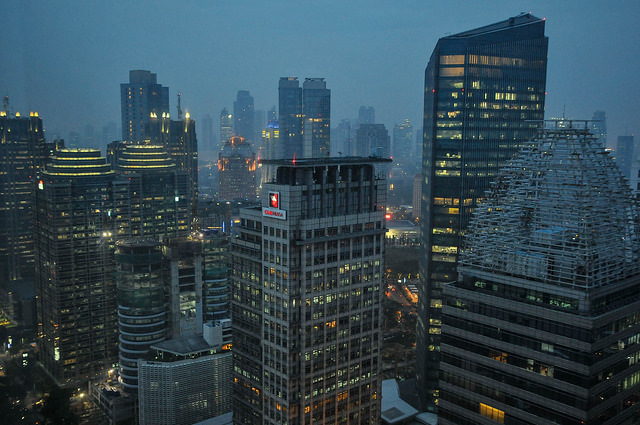 Low carbon development can reduce Jakarta’s air pollution while growing Indonesia’s economy. Photo by Aaron Minnick. So what would low-carbon growth actually look like for Indonesians? The gains from low carbon development will consistently and increasingly yield more over the next decades, starting immediately. In 2045, Indonesia will have added $5.4 trillion to GDP, relative to business-as-usual. Some of those gains in 2045 stem from: 15.3 million additional and good quality jobs, which are greener and better paid; extreme poverty halving again, to 4.2 percent of the population relative to 2018; about 40,000 lives saved every year from reduced air and water pollution; and the preservation of nearly 16 million hectares of forests that would otherwise have been cut down—an area of land larger than the size of England. Additionally, air quality and living conditions will have vastly improved, and the opportunity gap between women and men, and between provinces, will have diminished. Importantly, this Indonesia of the future will offer better value to investors than an Indonesia that grows through extraction and fossil fuel use. With low carbon development, each dollar added to the country’s GDP requires less up-front investment than it would with business-as-usual development, while also reducing the need for health expenditures associated with air and water pollution. Increasing land productivity by 4 percent each year, enabling Indonesia’s farmers to grow more food for more people using fewer resources. A fisherman casts his net in Yogyakarta. 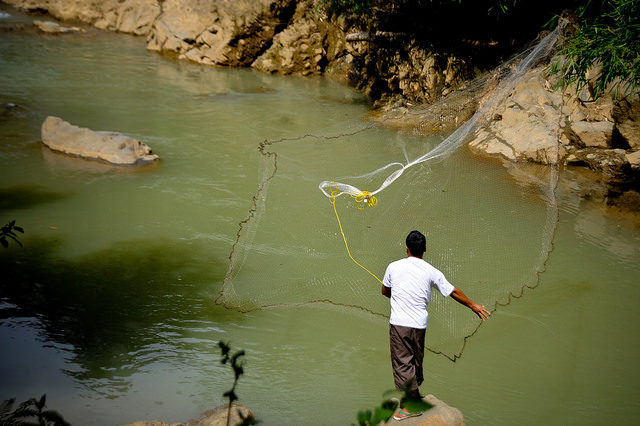 Fisheries conservation is an important part of Indonesia’s vision for low carbon development. Photo by the International Rice Research Institute. Crucially, Indonesia must ensure a just transition to a low-carbon economy. While better for the Indonesian economy and people as a whole, a small fraction of people and businesses— especially those that rely on high-carbon sectors and resource extraction—may be negatively impacted by Indonesia’s shift to a low-carbon economy. Low Carbon Development Initiative policies must support these people as they build new capabilities to participate in and benefit from the new low carbon economy. The report did consider even more ambitious policies and interventions, which would lead to even greater emissions reductions and better social and economic outcomes. This scenario, however, comes with implementation challenges. The government would need to further develop technical and institutional capabilities to move in this direction. Indonesia is the world’s 15th-largest economy and its fourth-largest greenhouse gas emitter. Given the country’s outsized impact on the global climate, transitioning now to a low carbon economy will be good not only for Indonesia, but for the whole world. Perhaps just as important, other governments can learn from the country’s example. Indonesia’s new development plan is ambitious, yes, but it is also necessary, achievable and economically prudent. If Indonesia – an emerging economy with an imperative to improve its people’s standard of living – can pull off low carbon development, then other countries can, too.